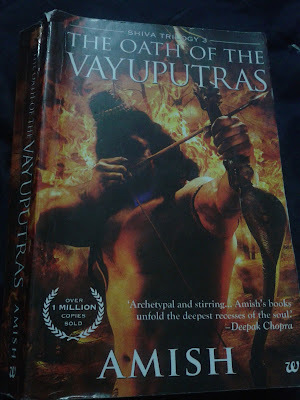 I really mesmerized by reading this book .This book has rewritten the ancient stories of gods in new limelight.Though this stories are fiction but they have captured the charisma of the characters ,the morality of the subject,the teachings ,the sanctity of Vedic stories,the romance of husband-wife,the valor and gallant of a warrior ,the fun in friendship ,the joy of family .I just cant find enough words to describe this book.Even when i'm writing i'm in hangover of this book .It's been just 3 minutes i finished this book and want to tell everyone READ IT AT ONCE :) . The story of God Shiva has been rewritten in mortal form of Shiva. The blind faith has been given a reason to worship. This book has been written so marvelously that it's hard to believe that this was fiction . The narration of the story is marvelous. We are told the stories by our grandparents of God Shiva .I have practically lived with them and now when i see this stories in new limelight. I'm just mesmerized. Really the author's imaginative skill cannot be compared. If it was 800-900 AD this would be one of the Great epic Granthas. I don't know and i cant tell why i'm so much exited about this story ,was it because i saw the stories of my grandma connecting and coming alive or is it the sheer narrative style of author who has taken over my mind at this moment i write this review.Be anything ,this book is must read book . Those who are reading the review I strongly recommend this book . The book has story of Shiva finding the evil. How excess of good can turn out to be evil and how nature tries to balance it. The patriotism of a soldier ,the love of loving husband and wife,the love of separated souls.Book has awesome narration of war strategies .Story has covered excellently how One's ideology can lead to disaster and how one person can save the disaster.How people trust their faith in their God without questioning. How the trust of people is sometimes enforced and mislead by rulers. How even the great minds can be mislead and lead to misfortune .I liked one part when the gallant of Sati is described. She fought so gallantly that she won over her enemies.Her enemy was proud to have fought her.She won the respect and honour of her enemy What can an soldier ,a warrior can demand !? .Then there are descriptions of Kartik fighting which takes you into the battle and you can imagine the battlefield.Then there the loving,caring and gallant son Ganesh .The Kali ,true form of wrath and anger in woman who had every reason to be angry.Then there is Brihaspati,a true friend who helps the cause of his friend in the shadows and his beloved Tara who truly in love ,gives up everything when she is told of his death. Then there is Parvateshwar ,the man of honour ,real patriotic,man of code who would sacrifice anything for his dharma. The story has so many moral examples that it can transform a person's thought ,as it did mine.Book has strengthened my morals. The love son towards mother ,the responsibility of king ,ruler. I really liked the climax it really had nice impact. I am worshiper of Shiva and when i read this story i could recall all the aspects covered of God Shiva. Though book seems religious IT IS NOT .the book is purely fiction inspired from the Hindu mythology and history,the ancient geography and science that reflects in ancient manuscripts in India. I don't like to reveal the story and ruin the book for reader. Believe me this book will have a lasting effect on you.